WARNING!!! this switch can switch up to 110/240V AC @ 10A. This is more than enough to cook your insides or “stop” your heart and kill you. Do not play with your house mains unless you know what you’re doing and you understand the risks. One mistake and you’re dead. If you’re not sure, close this page. It’s not worth it. 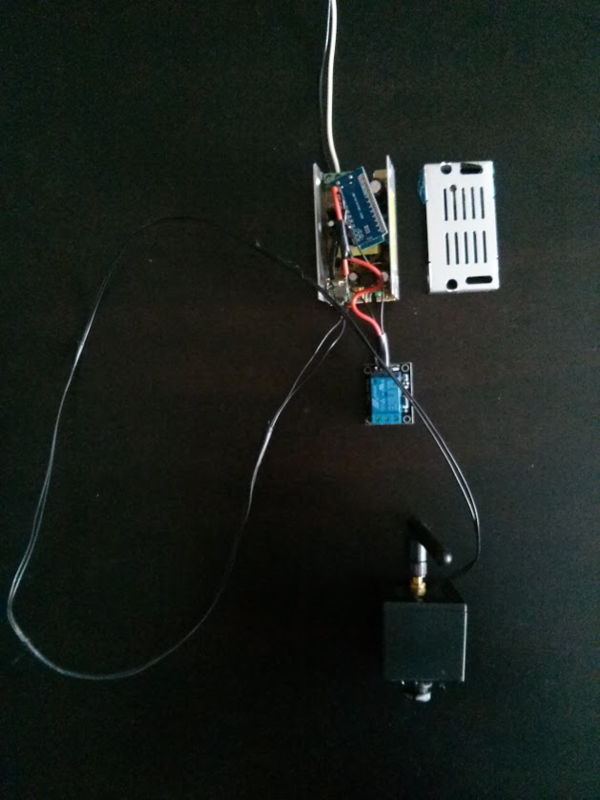 I made this WiFi switch to add an IP camera to the outside of my house, without having to run new power lines to it. The idea was to tap into the 110V AC of an existing outdoor porch light to power my camera. I would then keep the switch to the light ON all the time, to power my camera ON all the time. But I didn’t want my porch light to be on all the time. So, a WiFi smart switch will replace the wall switch to control the light. This was acceptable, since we don’t turn the porch light on/off frequently, and it’s better off scheduled (turn on at night) or automated (turn on when motion detected). Open the metal case, pack it in. AC comes in the top. DC goes out the bottom to the Relay, microcontroller and my IP camera. The input of the power supply is 110/240VAC and the output is 12V DC. My IP Camera uses 12V DC, so it took the raw 12V DC. But the Cactus Micro and the Relay need lower voltage. So I used the DC-DC converter to step down 12V DC to 5V DC. Closer look at the DC bits. The blue board I’m lifting up is the microcontroller that talks over WiFi and switches the relay. USB for scale. Closed up. Compact enough to fit into a wall conduit/switch box. The rest of the magic happens in software. There are 2 parts to the software. 1 part is the code you upload to the Arduino microcontroller. 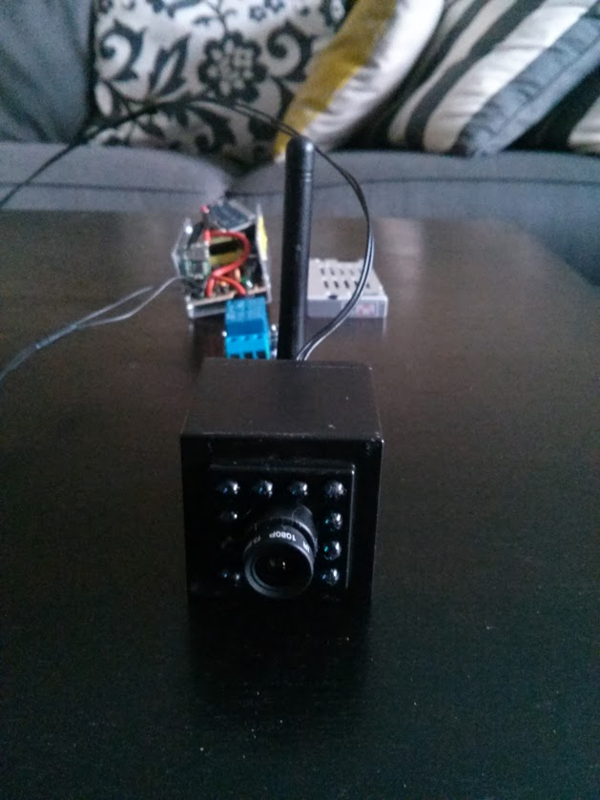 That connects to WiFi, listens for on/off commands and switches the relay. The 2nd part is what sends on/off commands to your smart switch. Let’s set up your MQTT broker first. MQTT is the protocol that we’ll use to send commands to your Smart Switch and switch it on/off almost instantly. You can think of MQTT as an “IoT Twitter”. It lets your switch “subscribe” to a topic. Then something else can “publish” to that topic to turn it on/off. You need a MQTT broker because that’s what passes your messages between publisher and sender. Arduino code. I used a Cactus Micro, which has 2 chips in one package: an Arduino chip and an ESP8266 for WiFi. 1st step is to program the ESP8266 with Espduino. 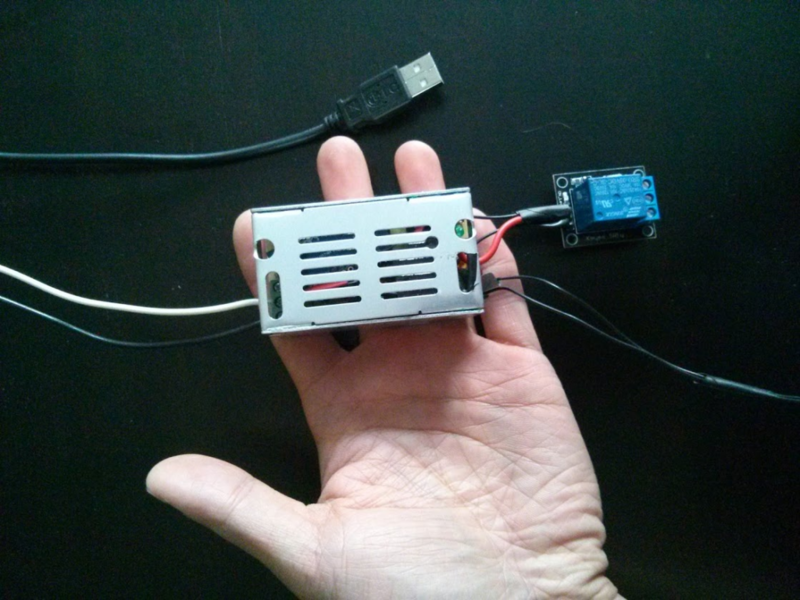 Espduino is an Arduino library that makes it easy to connect to WiFi and talk MQTT. Set up your Cactus Micro arduino to flash the ESP8266’s firmware — upload this Arduino progrmamer sketch: http://wiki.aprbrother.com/wiki/How_to_made_Cactus_Micro_R2_as_ESP8266_programmer. 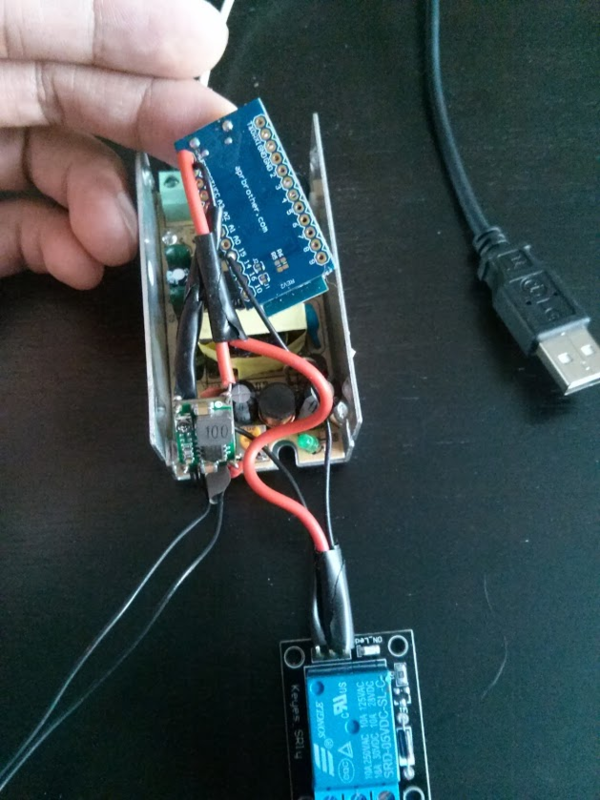 Flash the ESP8266 with the “espduino firmware”: https://github.com/AprilBrother/espduino/tree/master/esp8266/release. Use the NodeMCU Flasher if you’re on Windows and the esptool if you’re on Linux. IMPORTANT: Use Arduino IDE version 1.0.6. If you use version 1.0.5 your Cactus Micro will be unstable and randomly crash. Disclaimer: The code below has a little more than the MQTT on/off stuff. I wanted to also show you how to sync time and also upload data to thingspeak.com. If you don’t need those, just delete them. I included them because I’ve found them useful in all my projects and they show you how you can upload/download regular HTTP via Espduino. I also included some bulletproofing code that reboots the ESP8266 if it malfunctions. Once you have everything set up, you can power your switch and test it using the CloudMQTT “Websocket UI.” The code above subscribes your switch to the “/homebot/switches/MY_SMARTSWITCH/cmd” topic. Send a “1” over MQTT to turn it on. Send a “0” or whatever else to turn it off. P.P.S Please don’t die by being stupid with electricity. Actually it’s probably best if you don’t try this project.